The West End is the destination for nightlife in Brisbane: the cinemas, the bars, the clubs, the restaurants are all condensed into this area. Undoubtedly, a raft of sleek and chic watering holes have established legions of fans, and should prove worthy of a visit from out-of-towners. We examine the best bars in Brisbane’s hip and happening West End. East meets West in the heart of the West End at this pan-Asian cocktail haven. The intimacy of the space is underscored by the sensual red lighting, local artist designed chandeliers, fish-scale walls, the dome ceiling, and the sheer abundance of nooks within Lychee Lounge. Not often in Brisbane do you find a watering hole with its own Opium Den and samurai-inspired bar. The other main draw, however, is undoubtedly the mixologist’s list of cocktails, curated by award-winning cocktail creator Pez Collier, that source ingredients from exotic spirits and draw upon unusual flavour combinations to create unique sensory experiences. Head down on a Monday night to enjoy a share plate and a jam jar cocktail for only $10. The newest buck on the West End bar scene is Cobbler, a trendy dive where, under the vintage cage lights and in amongst the bookshelves, patrons will be astounded at the 400+ whiskeys on offer from around the globe. Cobbler has got all your barrel-aged bases covered: from Scottish single malts to Irish, Japanese, and even Australian offerings. If whiskey isn’t your tipple, there is a seasonally changing cocktail list, beers on tap and an additional library of tequilas. This bar is also bluntly a beverages-only joint, but fortunately, it’s BYO food. Come on down and take advantage of the reams of knowledge behind the Cobbler bar. By day it’s a sleepy West End café, but once the sun sets Pallet Bar and Brew transforms into a popular craft beer bar that also stocks local wines, spirits, and cocktails. Couches and hessian bag stools invite patrons to lay back and sip slowly on their drinks, and share platters with cured meats and cheeses are also available if you want to spend a larger chunk of your evening here. The highlight of Pallet is their Campbell Soup night for creative types, which showcases local art, music and best of all, $5 drink offers. A neighborhood favorite, The End occupies the space of the former Trash Video store. Homage is paid to the bar’s former occupation in the old VHS accouterments adorning the narrow space that can only squeeze in around 100 people. But the dedicated bohemian crowd who regularly pack in are all too aware of the charms on offer: vinyl sets from local underground DJs and several craft beers on tap – a particular favorite is The End vs. Blackstar Mocha Stout, a collaboration with Blackstar Roastery Works. As their website accurately boasts, this is the premier destination for handpicked flavour and refined libations. Hitting a chord with hipsters and Saturday night hen parties alike, Jungle is a tiki bar par excellence. The proprietors fully commit to the Polynesian theme, from the décor (totem carved timber stools and bamboo furniture) to the huge measures used in the preparation of the rum cocktails. Fans of Indiana Jones and the Temple of Doom might also appreciate the monkey-shaped mugs that the cocktails are served in. A true West End original. A social hub for the West End, this modern bar and bistro is the destination of choice for office workers seeking a liquid respite to kick off the weekend. Live music acts play regularly, and in the tranquil courtyard outside you find jugs of beer in abundance. The owners of Lock’n’Load Bistro like to describe themselves as a ‘drinkery with food’, owing to its round-the-clock opening hours from breakfast to supper time. Loft has styled itself as a New York Village bar – a late-night lounge and dining venue in the heart of the West End. 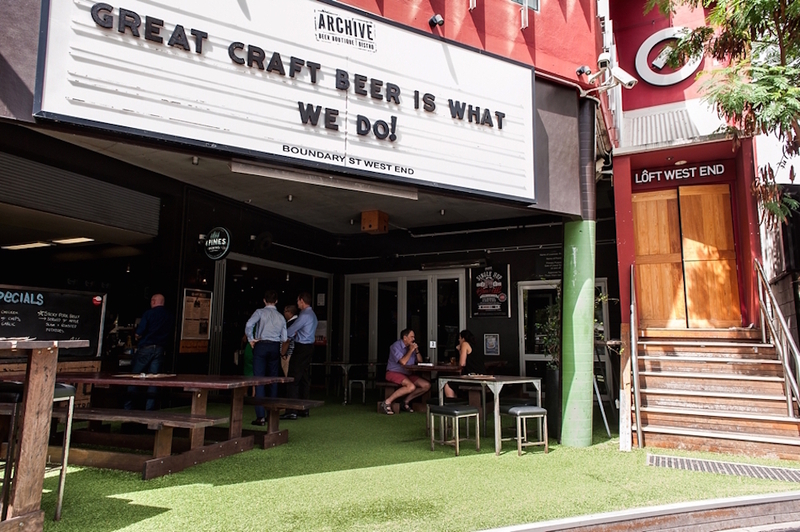 Since it is above Archive Beer Boutique, there is again a strong attention paid to craft beer, with breweries such as Holgate Mt Macedon and White Rabbit White Ale featuring on the tap list. But for the more upmarket clientèle, the cocktail and wine lounge aspect of Loft is in the bar’s antique garden, hanging greenery and open deck from which you can people-watch amidst the bustle of Boundary Street. Grazers are also catered for with Loft’s Taster Menu that features pulled pork sliders with spicy coleslaw and pecorino-crusted lamb cutlets with mint peas. The acronym of this Vulture Street bar, the Bar of Social Conscience, refers to its wonderful social mission: 20% of profits are donated to charity and BOSC’s entire ethic is centered on sustainability. But that’s not the only reason to feel good about paying BOSC a visit. As a boutique bar, it includes an extensive choice of local craft beers and fine wines. Hop-heads will be bowled over by the monthly ‘Tap Medley’ which rotates the beer selection through eight locally sourced beers. Make sure to take BOSC up on their claim that they are the home of the gin cocktail in Brisbane.